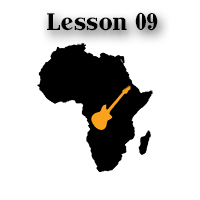 See my fingerpicking guitar video of the African guitar style above. You can get the TAB at the bottom of the article! This lesson is the 3rd example of the alternating thumb pattern. Playing the bass line and generating a kind of rhythmical motion adds an interesting groove to your music, so don’t miss the previous lessons either! Of course, the melody is present simultaneously; it’s being played on the top strings. What makes this piece interesting is the slides in the melody, executed by the fretting fingers. There are actually three different kind of slides in the tune, all of these are two fret legato ones. All of them are repeated multiple times as well, so once you figured each one of them out and practiced them correctly, you’ll be able to play through the piece without much problems. There are some pinky movements again as well, but by now you should be able to handle those, too. If not, just check out the previous lessons! You have probably noticed that during those interesting slides, the bass line stops playing. It doesn’t only make the piece easier to play, but also gives it a greater sense of dynamics. The brain likes those, and interestingly, it doesn’t miss the continuous pulse of carrying the low end all the way through, as long as it keeps returning from time to time. And as you can see and hear, it does. 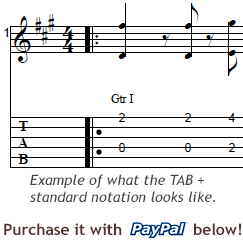 The 2nd part of the song takes place in the 1st position of the fretboard. It means that while it sounds impressive when played at speed, it’s also a breeze to play. Enjoy!